Above: one of the many "faces" of Junkanoo, the main cultural festival in the Bahamas. The 294,982 people who live in The Bahamas are predominantly of West African descent. Their ancestors were slaves brought to the islands to work the cotton plantations until 1834, when Britain abolished slavery in all its territories. Most white residents of are descendants of the first English settlers, who emigrated from Bermuda in 1647 to gain religious freedom. Some are also related to the Loyalists who fled the southern United States during the American Revolution and built enormous plantations here. After the abolition of slavery, life in the islands changed drastically. The plantations were dissolved, and both blacks and whites turned to the bountiful sea (sponging and fishing) or tried to farm. The lack of fertile cropland prompted the islanders to become a nation of seafarers, and Bahamians used these skills to great advantage during the days of shipwrecking, gun running, and Prohibition. Bahamians take great pride in their past, especially their names, which are indicative of a rich cultural legacy. There are many common names like the Gibsons, reputedly from Scotland; the Alburys, Malones and Russells, said to be Irish Loyalists; and the Eleuthera Bethels, who say they came with those zealous adventurers years ago. It has been said that the Bethels once spelled their name with two 'l's', but removed one because of their religious convictions. The Black Bahamians' roots go back just as far, as evidenced by the many who took the name "Rolle," after Lord Rolle, a wealthy and much-loved planter in Exuma who, after emancipation, gave his land to his former slaves. Religion is an integral part of Bahamian life. Even the tiniest village has a church, sometimes two. The people's religious ardor and high regard for education are evidence of their Puritan heritage, derived from the Eleutheran Adventurers. Music is also in the very bones of the people. African rhythms, Caribbean Calypso, English folk songs and the uniquely Bahamian Goombay beat echo in the air. The fast-tempoed "goom-bahhh" resonating from the drums can be traced back to the days of slavery and is used both for story-telling and dancing. The legal and political institutions of the country reflect its Anglo-Saxon heritage. It has a bicameral parliamentary government composed of a Senate and a House of Assembly, a Prime Minister, an Attorney General, and an independent Judiciary, including a Supreme Court and a Court of Appeals. The Changing of the Guard ceremony, held every two weeks, continues the British tradition, and Bahamian policeman pride themselves on their starched uniforms. Many will not put on their shirts until they are on duty to preserve their formal appearance, which is quite impressive. The laid-back attitude of Bahamians is often misunderstood by those unaware that it evolves from years of a good life in a land where nature provides every need. There is always time to worry about the bad things tomorrow. Bahamians are humorous, helpful people who love to celebrate. Don't get too angry if you want to go shopping and everything is closed. It's probably the Queen's Birthday or some other holiday. Weddings and funerals in The Bahamas are especially important social events. People begin celebrating a marriage weeks before the official ceremony begins, and the passing of loved ones is commemorated by parties long after they are gone. 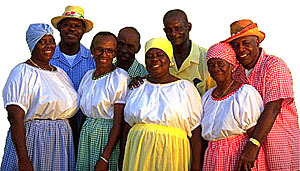 To find out more about Bahamian culture, be sure to contact People-to-People at (242)326-5371, (242)328-7810, (242)326-9772. This year-round Ministry of Tourism programme gives visitors a genuine and informal view of Bahamian hospitality and culture as you might see it when visiting a friend.